For those fans of PENS UNIVERSE who are not as in tuned with social media and consequently unfamiliar with our activity on Twitter, this is for you. 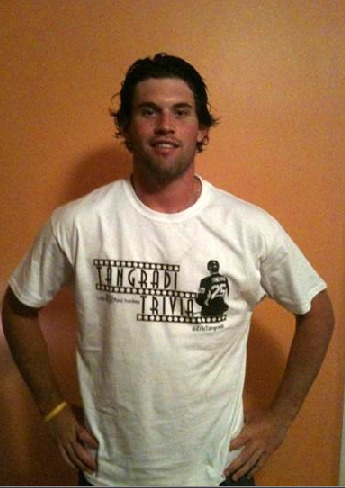 Recently we've teamed up with WBS Penguin LW Eric Tangradi to produce t-shirts on his behalf for his critically acclaimed Tangradi Trivia Time on Twitter. Each Wednesday at 10pm Eric spends some time interacting with his most loyal followers/fans and asks thoughtful, yet entertaining questions. Whoever answers the question correctly and the fastest gets acknowledged publicly by Eric on his twitter page. Since the birth of the t-shirt idea, Eric has agreed not only to give a few away as a token of his appreciation, but also put the shirts up for sale in our Zazzle online store. Furthermore he's agreed to donate all the proceeds to our current partnership with the Cooke Foundation of Hope. The entire project is a non-profit effort to help continue to raise funds for benefit of the Cooke Family. We want to publicly thank Eric for his noble participation and ask our fans of PENS UNIVERSE to join Eric on Twitter on Wednesday nights (trust me, its fun) and please consider purchasing a t-shirt to help.